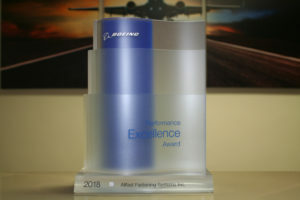 Allfast Fastening Systems has been awarded the Boeing Performance Excellence Award for achieving superior supplier performance. This makes the eighth year in a row that Allfast has received this award. Boeing is one of our largest customers and we are proud of the outstanding performance by an entire team of people sustained over so many years,” said Dave McNab, General Manager.